About the work: This is a pair of Psyche-themed shoes. 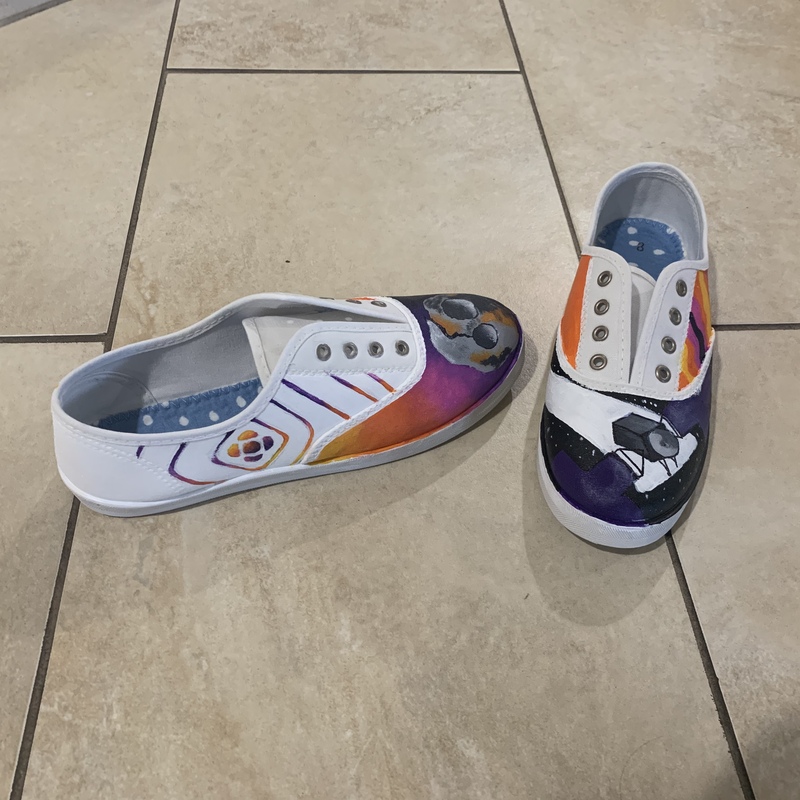 Using acrylic, I painted the asteroid and the Psyche mission badge on one shoe and the spacecraft on the other. I tried to keep the shoe vibrant while using only greys, pink, orange, and purple, as these are the Psyche mission colors. I was heavily inspired by artwork from previous interns. 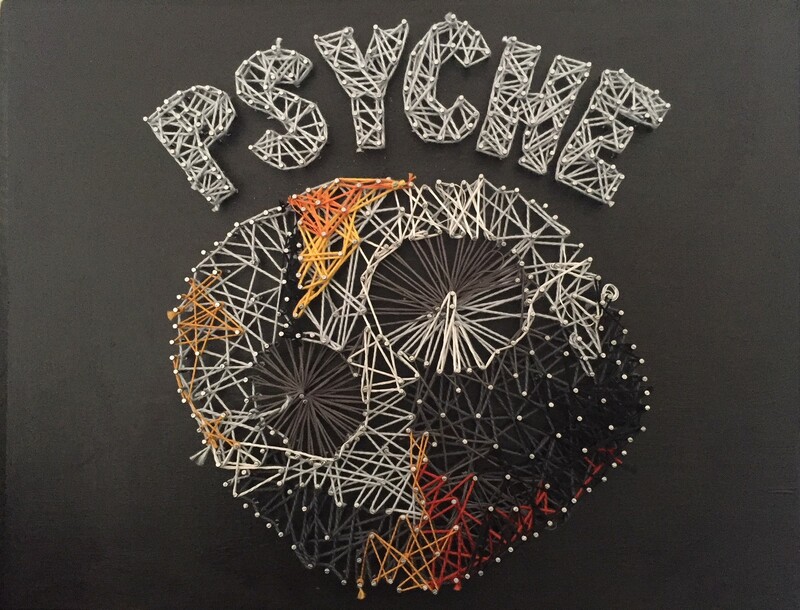 About the work: This piece is the Psyche asteroid pictured in string. It is another way for one to depict Psyche. After finishing the piece, I noticed that my piece, a jumbled mess of string, is similar to the jumbled mess of metal that makes up the Psyche asteroid. About the work: I wanted to highlight the idea that Psyche could have been a core of a planet. This is imagining what could have been and all the life that could have occurred. I think this is a major part of astronomy, imagining all the possibilities in the universe. 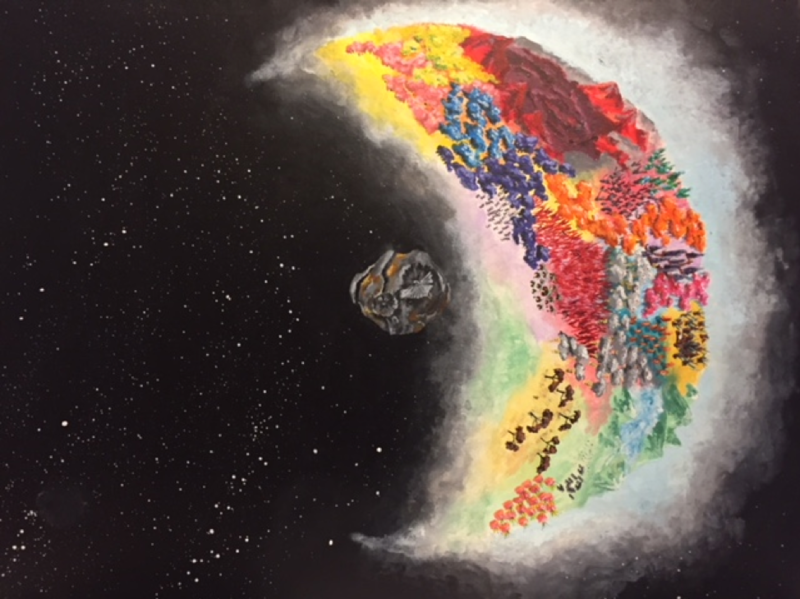 On one side I made a colorful, crowded planet slice to convey a feeling of liveliness. There are trees, mountains, and other vegetation painted in ways they may not be seen on Earth. For example, there is a red mountain range with a dark whirlpool on one side of the planet. There are also forests that range from the normal green and orange we see on Earth to alien purple and blue trees. This slice fades into space. On the other is Psyche as it is now, empty and without life. There is emptiness save for a few stars off in the distance.